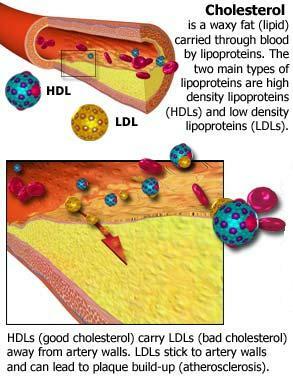 AkmalHussin.com: Tips for maintaining cholesterol levels. Tips for maintaining cholesterol levels. Remove all fat and skin from meat, poultry before eating. Change the style of cooking from frying to baking or grilling. Avoid fatty dressings and sauces. Replace the cream with yogurt sauce and garnish. Choose fresh fruit for dessert instead of cakes or cookies. Use vegetable oils such as canola, olive kesumbar and in small quantities for frying. Reduce the use margarine because it contains partial oil ter-hydrogen (trans fatty acids). Limit intake of foods containing palm oil, coconut oil, lard, butter, egg yolk and milk fat. Shrimp and shellfish can be taken once in a while because kolesterolnya content lower than it looks and it is low in saturated fat. Add fiber to your diet especially oat fiber. Choose whole grains when buying bread or cereal. Limit your intake of animal organs such as liver, kidney, brain and spleen with high cholesterol. Exercise is an important weapon to fight against high cholesterol and heart disease. Studies show that regular exercise (about 30 minutes three to five times a week) can increase HDL levels and get rid of excess LDL cholesterol from the blood. You can do aerobic exercise, swimming, weight lifting, walking and dancing. What is qualities of truly confident people? Happy Birthday! Mr Donald Trump. Are You an Impulse Spender? Why Should You Make a Budget?